Understand YOUR Mortgage Loan & Save thousands of Ringgit ! Daily Rest means Interest is calculated daily – a term that sounds simple but how many of us really think seriously about this? It basically means that if you pay your monthly instalment 1 day earlier, will save you 1 day interest of the principal amount. If your loan was RM 500,000-00 at 4.65% a year 1 day interest = 4.65/100 x 500,000-00 x 1/365 = RM 63.70/day. Therefore, if someone show you if you pay one week earlier each month, you will save on your interest, it’s extremely true. But why do you need to pay to being told to do this? Hence, any extra payment made each instalment will definitely save you interest in long run as more will be paid to principal and will immediately reduce your interest on the next business day. 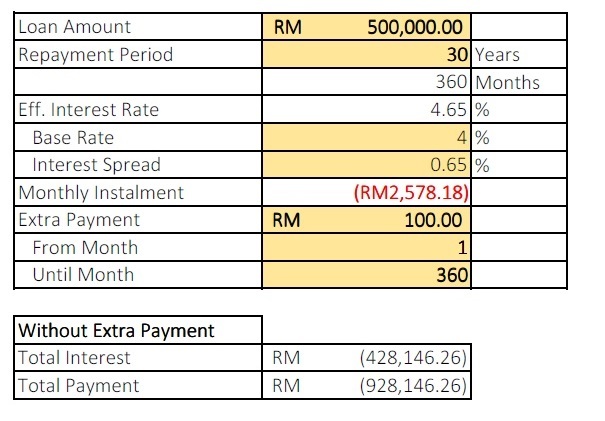 I’ve done a simple example to explain on how significant extra payment can save you thousands of Ringgit on your mortgage loan. We can observe that, we will save RM 38,083.42 and shorten our loan by 2.3 years. Many might doubt about this, but it is really as simple as this. The more you pay extra, the larger the amount you can save. Previous Previous post: How Does GST affect Property Purchasing Process? Next Next post: Mortgage Loan: Bi-Weekly Payment REALLY Save Your Money?